HONOLULU -- The Aina Haina Public Library will reopen on Tuesday, April 9th at 1:00 p.m. after completing extensive repairs and renovations caused by flooding a year ago. During the closure the library's collection was placed in storage, furniture and equipment were cleaned and updated, flooring was replaced, bathrooms were renovated, and the interior was repainted. Now that the renovations are complete, the Hawaii State Public Library System is excited to welcome the community back into this library with a special celebration on April 9th. As part of this reopening celebration, the Aina Haina Public Library is launching a new lending collection of ‘ukulele. This will make Aina Haina the third lending location for this fun new service. The ‘ukulele instruments are provided and supported by Music For Life Foundation and Jake Shimabukuro, co-director of the ‘ukulele sponsorship. Aina Haina Public Library's public service schedule is: Tuesday, 1-8 p.m., Wednesday, Thursday, Friday and Saturday, 10 a.m. to 5 p.m., and Sunday and Monday closed. The library is located at 5246 Kalanianaole Highway. One of the best public resources in Kaimuki! 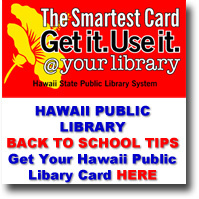 The Hawaii State Public Library System provides Hawaii's residents in all walks of life with access to education, information, programs and services.